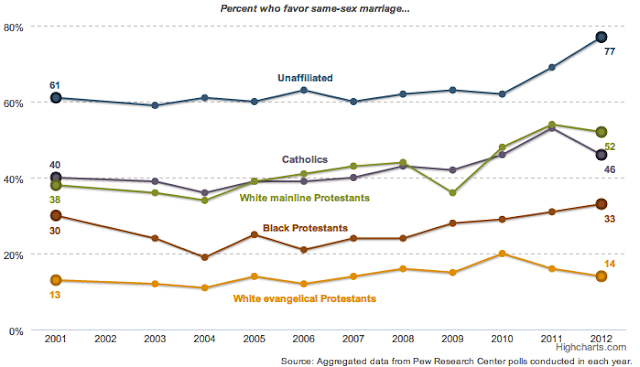 The Pew Forum on Religion and Public Life just released some new data which allows us to view the changing attitudes on gay marriage over the course of the past 11 years. 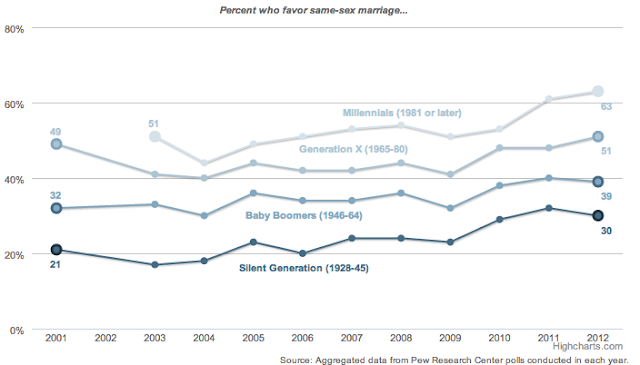 It's easy for supporters of equality to become frustrated with recent anti-gay marriage legislation (and the promise of more coming down the pike), but it is encouraging to step back and view the changing attitudes over the past decade or so. While a decade seems like eternity when you are being denied the rights that others enjoy, it is a relatively short period of time for such a sea change in acceptance. While there's a lot of data to pore over, let's take a look at four graphs that provide us with a basic overview of this shift. 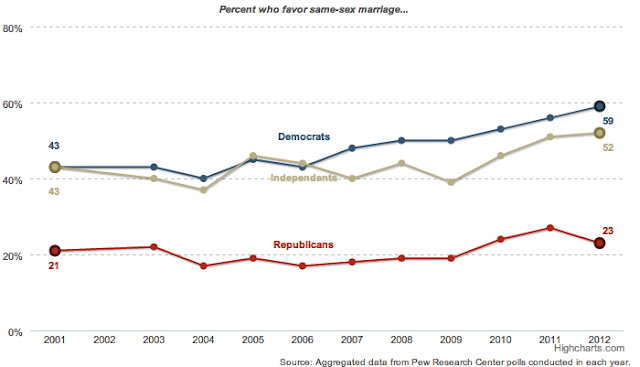 2012 is only the second year (2011 being the first) in which Pew recorded a majority in favor of gay marriage. Due to vocal support for marriage equality in the media, in businesses, on social networks, and even in religious bodies, it is likely that we may have reached a tipping point, in which case we can expect an accelerated rate of acceptance in the coming decade. We also can expect to see a continued rate of increase of support as millennials age into the working and voting demographic, and as the older generation of politicians, business owners, and clergy members start to, uh, get out of the way. So, who exactly are these people who are so anti-equality? As they say, sometimes stereotypes exist for a reason. If you guessed that white evangelicals were the most anti-equality religious demographic, you're right. And lo and behold, it's the 'religious nones' who by and large don't have any problem with the gays marrying. This would be the atheists, agnostics, and those who are religious but simply don't belong to any of the main doctrine-driven denominations. 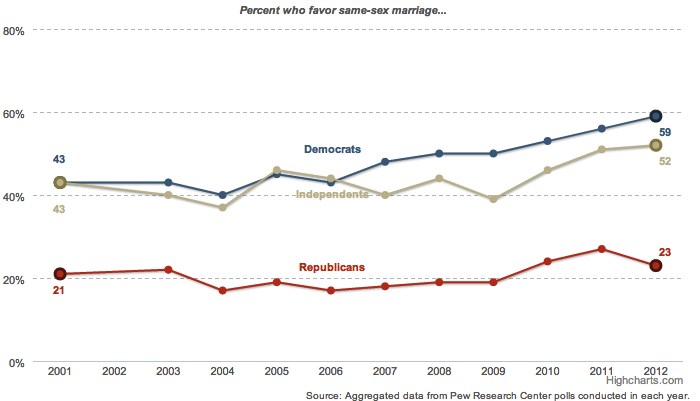 Also, if you guessed Republicans are the most anti-equality political affiliation, you win a prize. However, Democrats and Independents aren't exactly the 'live and let live' types as we are often led to believe. There's more where this came from, but the takeaway should be clear. Gay marriage is inevitable, folks. It's just a matter of how soon, and certainly for many it couldn't be soon enough. We have seen the future of America. They're young, they're not beholden to antiquated dogma, and they're not scared of the gays.